500h of full hydration in a jar, whatever the conditions¹. New Aquasource's hydrating formula is extra-charged in regenerating Life Plankton™ and moisturizing Mannose to keep skin ideally hydrated hour after hour, whatever the conditions. Skin is water-plumped, radiant as if newly moisturized. Discover new Aquasource formula in this cream texture for ideal confort and long lasting hydration. 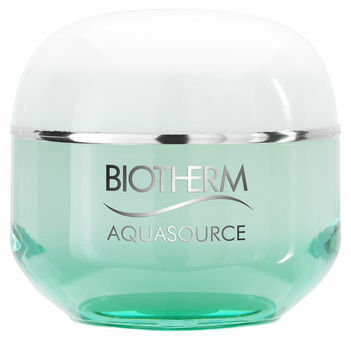 Ingredients Biotherm skincare is formulated with Life Plankton™. This miraculous patented ingredient, in affinity with the skin, has incredible soothing, fortifying and antioxidant properties. KNOWN PROPERTIES: the association of Life PlanktonTM cellular water, rich in 35 vital nutrients (including vitamins, minerals, amino-acids) and Mannose, able to act on epidermis deep layers. 1. Apply with the tips of your fingers in gentle outwards movements around your eyes. 2. Press the tip of your index on the inner corner of your eyes and massage under your lower eyelid in small circular motions. 3. Tap gently around your eyes with your fingertips: above your upper eyelid following the line of your eyebrows and then under your eye in outwards motions. Apply this gel cream to the face morning and/or evening. New Aquasource formula, extra charge Life Plankton™ comes in a light cream texture to provide your skin ideal confort and hydration. Suitable for all skin types even sensitive.